Learn about freezing your eggs over cocktails and appetizers. Women curious about freezing their eggs no longer have to visit a doctor's office to learn more about the procedure. Now, they can get that information over cocktails. Dr. Aimee Eyvazzadeh, a California doctor nicknamed the "Egg Whisperer," is hosting parties for women who are considering postponing parenthood while they pursue careers in Silicon Valley. She hosted her first "egg-freezing party" Monday in San Francisco, about a month after tech giants Facebook and Apple announced they would pay female employees to undergo the procedure while they continue to work. "I thought, 'Oh, my God, the culture is changing,'" Eyvazzadeh said of the news. "People might really want to hear what I have to say." She had just launched a website to promote her egg-freezing parties, so the timing was perfect. Eyvazzadeh threw the first bash at a Spanish restaurant, and while she spoke about fertility and the egg-freezing procedure, about 15 guests indulged in appetizers and cocktails. 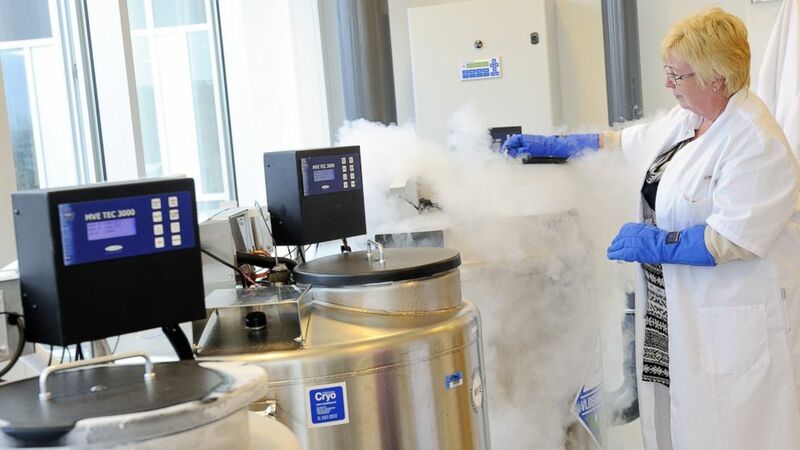 (Lex Van Lieshout/AFP/Getty Images) A technician opens a vessel containing women's frozen egg cells in this April 6, 2011 file photo taken in Amsterdam, Netherlands. "I think about where I would want to go with my friends on a Monday or Tuesday night. We want to catch up, hang out," she said. "The other option is to do it in a clinical setting, but that just feels so cold." One guest told ABC News she thought the environment, and being around other women with the same interest, made it easier for her to open up and ask questions. "Being able to hear other people's experiences was very validating," said Wanda Lee, 28. "Being able to share this information in a non-conventional platform is nicer than having to go to a doctor and make an appointment and ask questions. "We talked about Facebook and other companies offering this, and they have a lot of backlash," Lee added. "But this is encouraging. We want a career, we want to do this now. We just want an insurance policy for the future." Eyvazzadeh's idea for the parties happened naturally. "Over years, I've been invited to parties and everyone just wants to talk about what I do for work. It's really fun for me, I love what I do. So I had this idea to turn it into a girl's night out." Her second party is scheduled for tonight at a restaurant in Walnut Creek, California.